It’s possibly my biggest gripe with online accounts, and the simple thing that can make the whole process that much less frustrating seems soooooo obvious, that I am forced to believe that those who set up this system, have never even used their own creation. Either that, or they just want to waste my time and frustrate me – to decisively distract me from all of the real things I have to get done. Hard to say exactly. “The username or password entered is incorrect”. 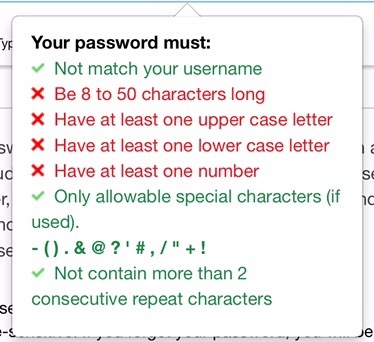 If, on my VERY FIRST FAILED ATTEMPT to login, they had provided their password rules, I could have avoided 15-30 minutes of runaround, and not be forced to create a brand new password variation that I will fail to remember the next time I try to log on. I mean, it’s like they never even used it!